Astronaut Shane Kimbrough is seen inside his spacesuit during a spacewalk on Jan. 13, 2017. Scientists are researching how International Space Station astronauts adapt to new technology as NASA prepares to send humans beyond low-Earth orbit. Crew members will have to learn how to operate new types of spacecraft and adjust to planetary surfaces with different microgravity environments. As part of this research, Expedition 50 Flight Engineers Peggy Whitson from NASA and Thomas Pesquet from ESA started Monday morning with an interactive test on an iPad. The test is part of the Fine Motor Skills experiment that observes how astronauts interact with new technologies potentially influencing the design of future spaceships, spacesuits and habitats. Commander Shane Kimbrough worked throughout the day on science hardware. He rebooted a computer on the MERLIN science freezer before swapping hard drives on a device that observes meteors entering Earth’s atmosphere. In the afternoon, Kimbrough videotaped himself reading a children’s book and performing a simple light experiment for school kids on Earth. The three cosmonauts, Oleg Novitskiy, Andrey Borisenko and Sergey Ryzhikov, worked in the station’s Russian segment on a variety of science and maintenance tasks. The trio explored the human digestion system and collected blood samples for a bone loss study. 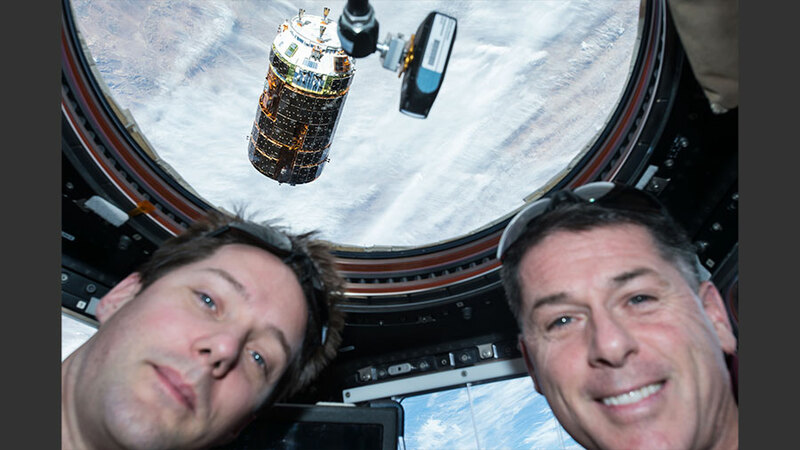 Astronauts Thomas Pesquet (left) and Shane Kimbrough pose for a portrait with Japan’s HTV-6 resupply ship orbiting a short distance away from the space station’s cupola on Dec. 13, 2016. The Expedition 50 crew is getting ready for Friday morning’s release of Japan’s sixth cargo craft to visit the International Space Station. The station residents are also continuing to explore how their eyes adapt to living in space for months at a time. 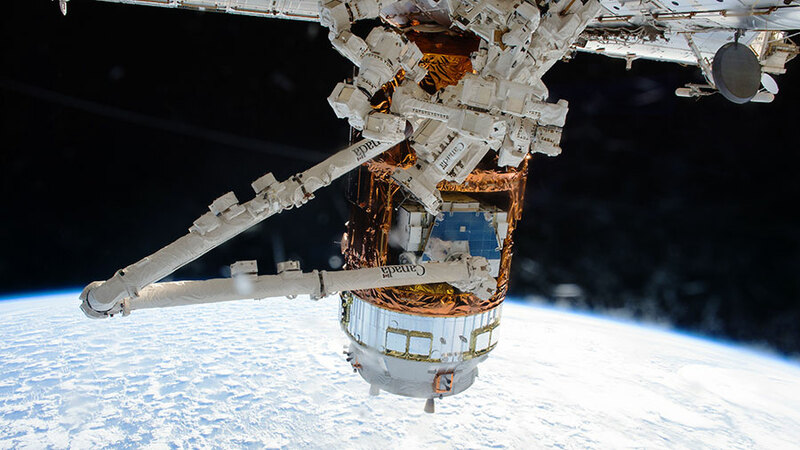 The Kounotori HTV-6 resupply ship, from the Japan Aerospace Exploration Agency, is being disconnected from station systems today as it prepares for its departure Friday at 10:30 a.m. EST. Overnight, ground controllers will operate the Canadarm2 and maneuver the HTV-6 away from the Harmony module where it is attached. European Space Agency astronaut Thomas Pesquet and Commander Shane Kimbrough of NASA will then command the 57.7-foot-long robotic arm to release Kounotori back into orbit. After the HTV supports science experiments for a week, Japanese flight controllers will command the craft to deorbit on Feb. 5 for a fiery reentry into Earth’s atmosphere. More Fluid Shifts research took place today as astronauts study the possibility of using a special suit, the Lower Body Negative Pressure (LBNP) suit, to prevent the upward flow of fluids towards the head caused by microgravity. This headward flow may be causing pressure on the back of crew members’ eyes potentially causing damage and affecting vision. During the afternoon, the crew also participated in ultrasound eye scans. Doctors on the ground assisted the crew to ensure good views of the optic nerve, cornea and back of the eye. The six-person Expedition 50 crew poses for a group portrait inside the Columbus lab module from the European Space Agency. 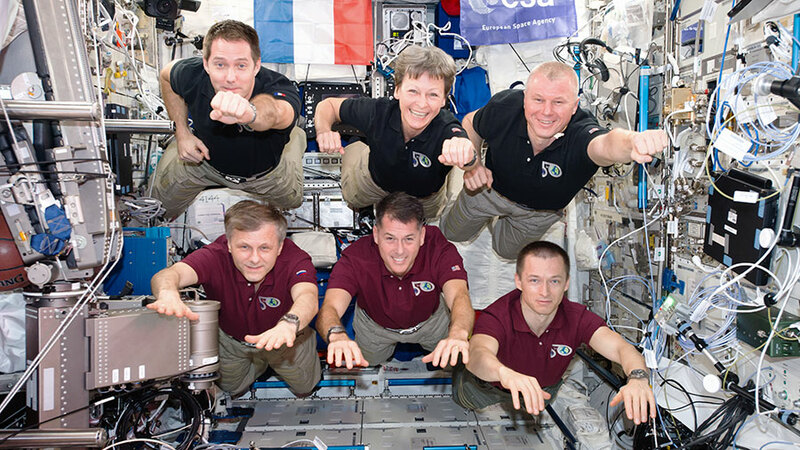 (Top row from left) Flight Engineers Thomas Pesquet, Peggy Whitson and Oleg Novitskiy. (Bottom row from left) Flight Engineer Andrey Borisenko, Commander Shane Kimbrough and Flight Engineer Sergey Ryzhikov. 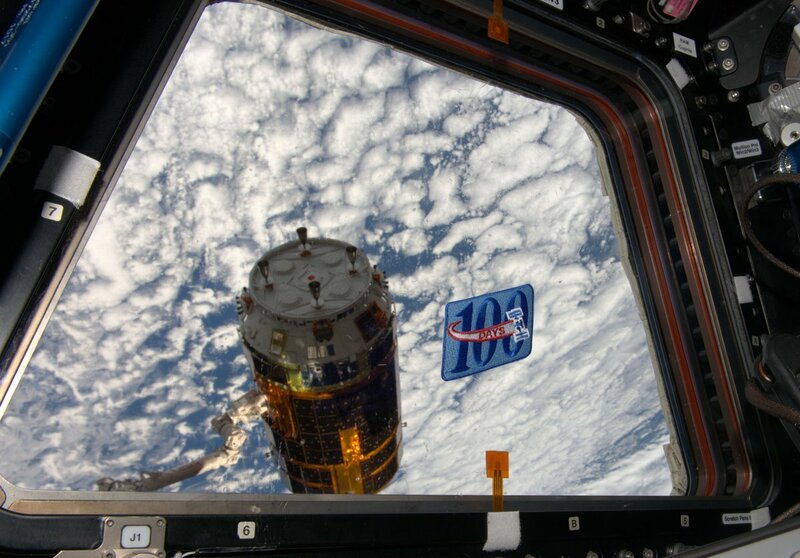 The Japanese HTV-6 resupply ship is packed and ready for its release Friday from the International Space Station. European astronaut Thomas Pesquet will command the Canadarm2 to release the HTV-6 at 10:30 a.m. EST. Afterward, it will enter Earth’s atmosphere for a fiery disposal over the Pacific Ocean. NASA TV will broadcast the release and departure activities live beginning at 10 a.m.
More eye exams were on the Expedition 50 crew’s timeline today to ensure the astronauts maintain good vision and help researchers understand the effects of microgravity on eyesight. The space residents used typical optometry instruments to look at the retina and the interior back of the eye. The crew also worked on maintenance tasks throughout the orbital laboratory. Gear used to analyze particles in the space station’s atmosphere was replaced after a failure was detected in a spectrometer device. Water samples were also collected from the station’s life support systems for quality checks and analysis on the ground. The next SpaceX Dragon mission is due to return these samples and other cargo back to Earth after a launch date is announced. 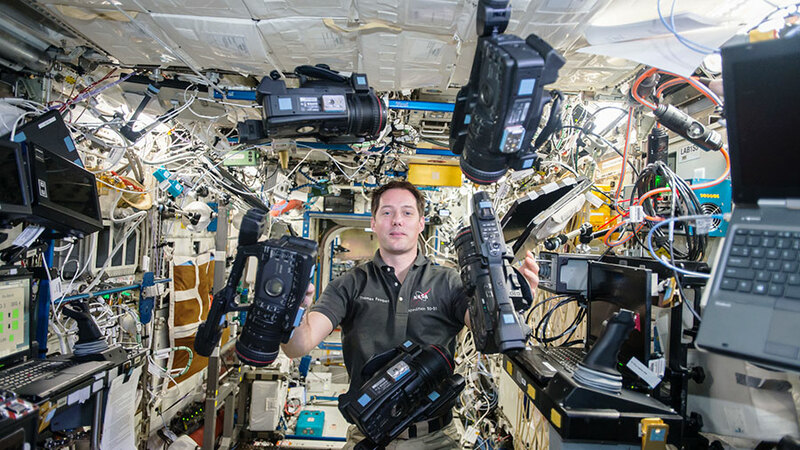 Expedition 50 flight engineer Thomas Pesquet of ESA (European Space Agency) juggles a set of video cameras in the microgravity environment of the International Space Station. The Expedition 50 crew members explored a variety of space phenomena today to help researchers improve life for humans and stimulate children’s curiosity in science, technology, engineering and mathematics. Scientists are working to understand how fluids behave not just in spacecraft fuel tanks and containers but also inside an astronaut’s body. Microgravity creates a headward flow of fluids that increases pressure on the back of an astronaut’s eyes potentially causing damage and affecting vision. NASA astronaut Peggy Whitson and her Soyuz crewmates Oleg Novitskiy and Sergey Ryzhikov explored the effectiveness of a suit that may reverse these upward fluid shifts. Whitson and Novitskiy used a combination of eye exams and ultrasound artery scans on Ryzhikov today while he wore the Lower Body Negative Pressure (LBNP) suit today. The LBNP may offset the microgravity-induced fluid shifts possibly reducing the risk of vision changes in space. Commander Shane Kimbrough reached out to schoolchildren this morning reading a story book and videotaping a simple fluids experiment. The Story Time From Space series seeks to increase science literacy by engaging students and teachers. Japan’s HTV-6 resupply ship is pictured attached to the Harmony module during robotics operations. Mission controllers are preparing to release Japan’s Kounotori cargo ship from the International Space Station at the end of the week. Meanwhile, the Expedition 50 crew is getting ready for a new protein crystal experiment and reconfiguring combustion science gear. The Japan Aerospace Exploration Agency is getting ready to complete its sixth cargo mission to the station. Overnight, robotics controllers maneuvered Canada’s 57.7-foot-long robotic arm holding an external pallet with discarded nickel-hydrogen batteries and installed them inside the Japanese cargo ship for disposal. Next, the Canadarm2 will release Japan’s HTV-6 resupply ship from the Harmony module Friday for a fiery re-entry back in Earth’s atmosphere. The HTV-6 arrived Dec. 13 four days after its launch from the Tanegashima Space Center carrying crew supplies, new science experiments and lithium-ion batteries to upgrade the station’s power supply. The California-based space company SpaceX is planning its tenth station cargo mission. 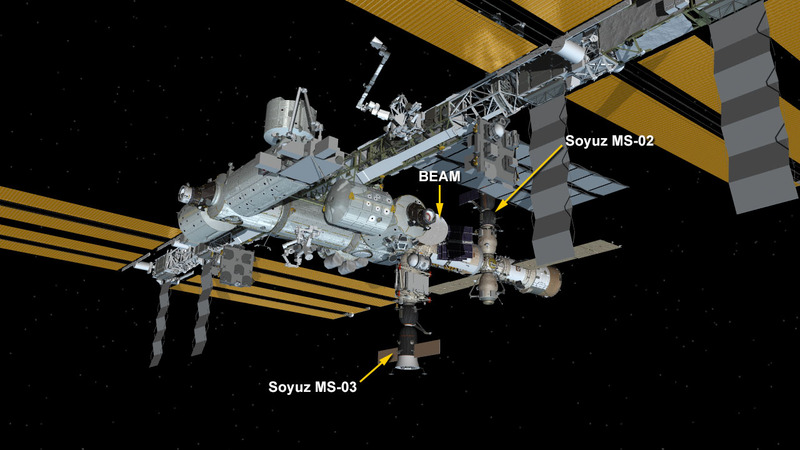 The Dragon cargo craft will deliver a new experiment to study protein crystals to help scientists design better drugs to fight diseases. In advance of the Dragon delivery, Astronaut Peggy Whitson set up the Light Microscopy Module with new lenses today to get ready for the new experiment installation. Commander Shane Kimbrough is getting the Combustion Integrated Rack ready for the Cool Flames Investigation (CFI). That study will observe how fuels burn at lower temperatures with no visible flames. CFI may engineers develop advanced engines and fuels and improve crew safety. 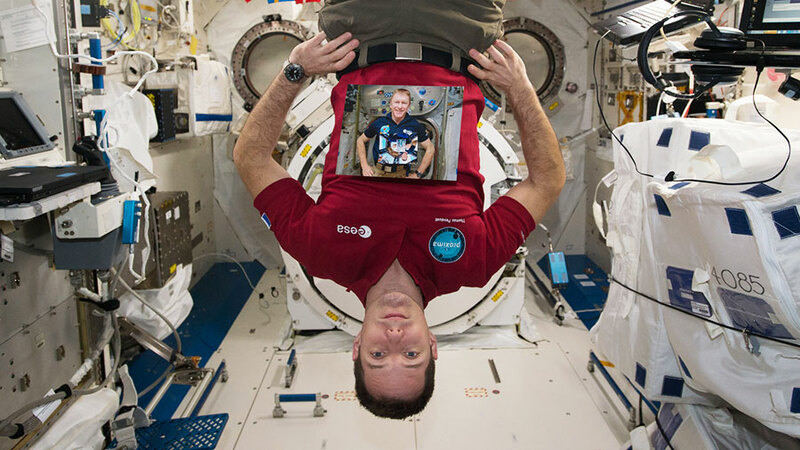 European Space Agency astronaut Thomas Pesquet poses with a photo of several of his European astronaut predecessors taken aboard the International Space Station. The International Space Station residents are wrapping up their work week today installing and checking science communications gear. The Expedition 50 crew is also continuing to explore how long-term space flight affects eyesight. Commander Shane Kimbrough and Flight Engineer Thomas Pesquet worked on increasing the operations and communication capabilities of science gear. The duo worked on separate devices to improve data transfers between different science racks allowing more research to be conducted on orbit. Whitson donned the suit today which pulls fluids down towards the feet to offset the headward flow. Novitskiy and Borisenko used an ultrasound scan and performed eye checks on Whitson to determine the effectiveness of the suit. Expedition 50 crewmates (from left) Andrey Borisenko, Oleg Novitskiy and Peggy Whitson at mealtime in Unity module. The Expedition 50 crew is continuing its investigation into vision changes and eye damage some astronauts have experienced after long-term missions in space. 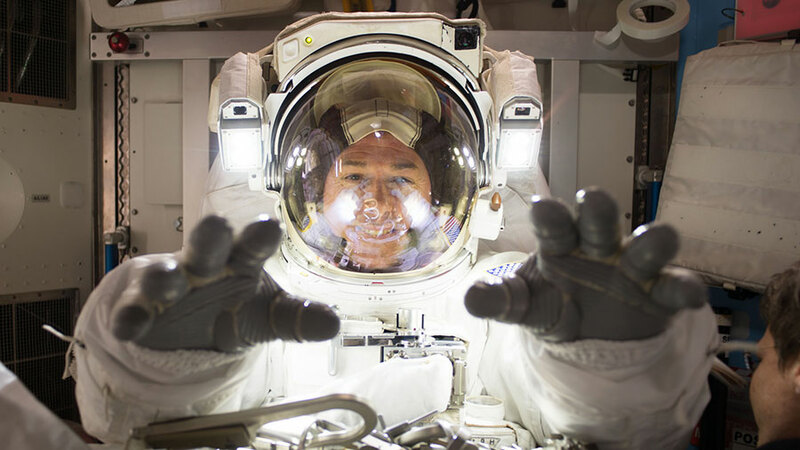 Living in the microgravity environment causes a headward fluid shift that may be causing pressure behind astronauts’ eyes resulting in visual and physical changes. Two cosmonauts, Sergey Ryzhikov and Andrey Borisenko, and European astronaut Thomas Pesquet explored a possible solution to the upward fluid pressure. Borisenko donned the Lower Body Negative Pressure (LBNP) suit which pulls fluids down towards the feet. Ryzhikov and Pesquet then used an ultrasound scan and performed eye checks on Borisenko to determine the effectiveness of the LBNP suit. On the station maintenance front, NASA astronaut Peggy Whitson installed vacuum access ports in the Harmony module. Commander Shane Kimbrough connected gas and water umbilical hoses in the Columbus lab module. He also updated supplies for the Human Research Facility that enables scientists to learn how astronauts adapt to living in space. 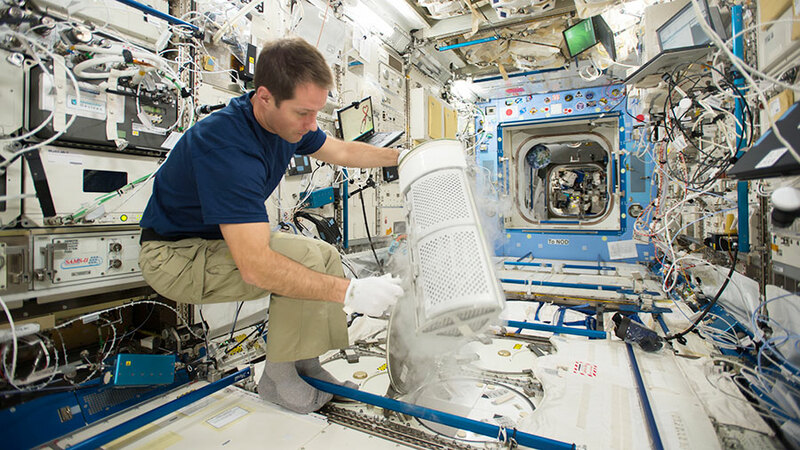 European astronaut Thomas Pesquet inserts a locker into a science freezer. The locker holds scientific samples for stowage and later analysis. Following a successful pair of spacewalks, the Expedition 50 crew has switched gears and is moving full-speed ahead with advanced space research. The orbital residents checked out science gear and studied the impacts of living in space. European astronaut Thomas Pesquet repressed the Japanese Kibo lab module airlock after a small satellite deployer shot a set of tiny satellites, or CubeSats, into Earth orbit on Monday. The variety of CubeSats will test new spacecraft deorbiting and propulsion technologies and be used for communication purposes. 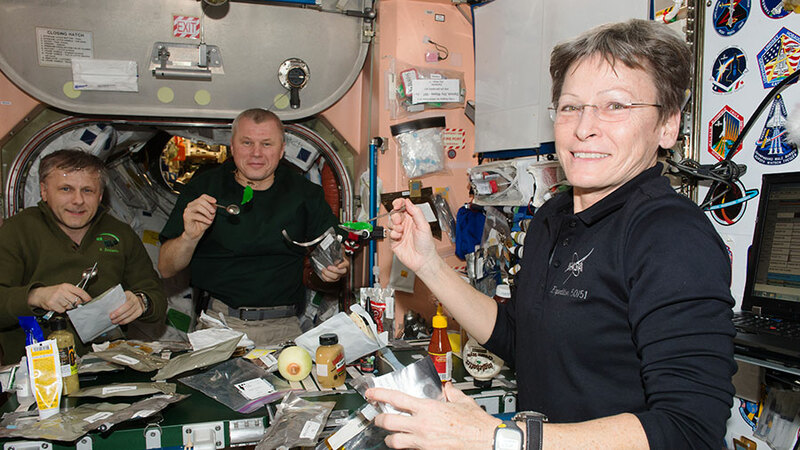 Flight Engineer Peggy Whitson joined veteran cosmonauts Andrey Borisenko and Oleg Novitskiy for the ongoing Fluid Shifts study and collected blood, urine and saliva samples. The human research experiment seeks to investigate vision and eye damage some astronauts have reported after their space missions. Commander Shane Kimbrough worked on combustion science gear troubleshooting a pair of devices that explore flames and high temperatures in space. Flight Engineer Sergey Ryzhikov worked inside a docked Soyuz spacecraft recharging computer batteries.